The stuff you look at, but don't see. Designer must-have: flying purses by Raven Kauffman. It’s CDB time once again at the PMCA! 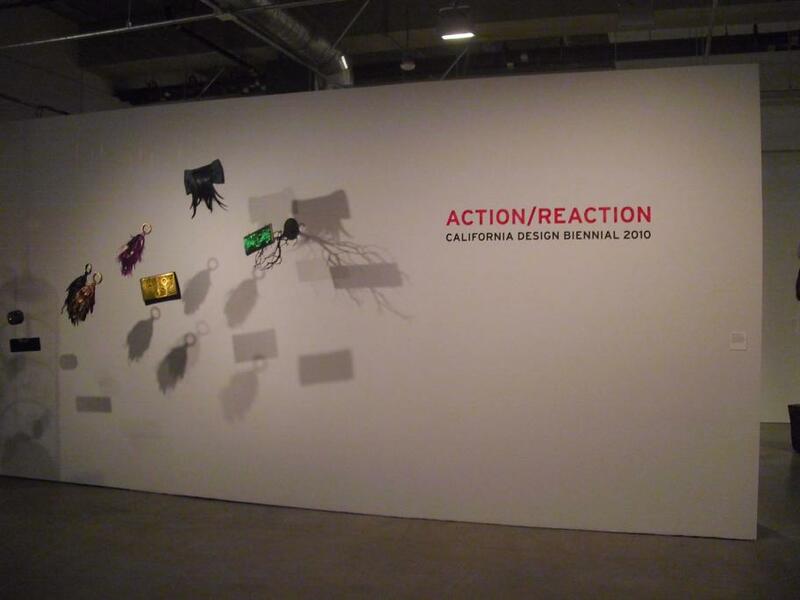 CDB, or California Design Biennial has been organized by PMCA since 2003, and focuses on new directions in design from California designers. There are two significant changes to this Biennial’s format. One: along with the categories of product, graphic, transportation, and fashion design, the category of architecture has been added this year. Two, instead of a juried panel, each category has an invited specialist serve as curator. The curators are Louise Sandhaus from CalArts (graphic design), Rose Apodaca fashion journalist (fashion design), Stewart Reed from Art Center (transportation design), Frances Anderton of Dwell magazine (architecture), and Alissa Walker (product design). Everyday object or Art? I don’t kayak everyday. Each category has great work, but the show is not organized into these categories. 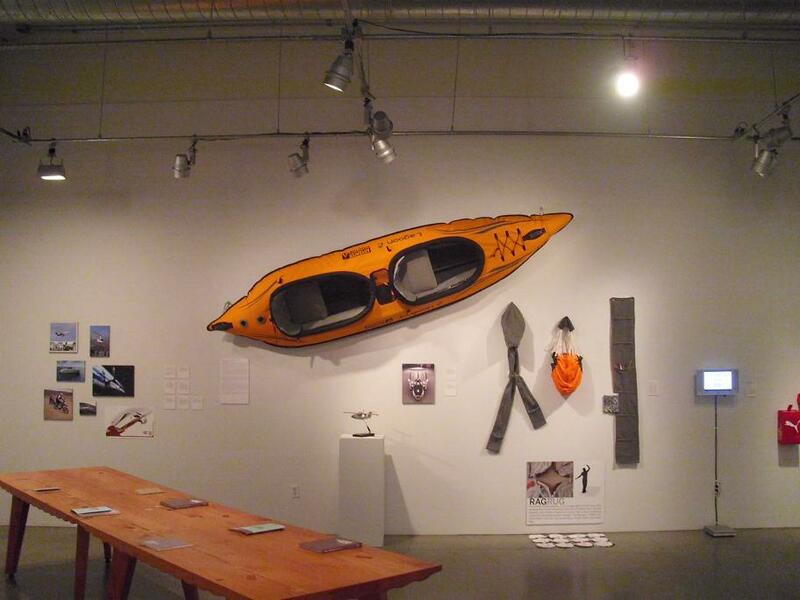 The PMCA galleries are filled with mannequins, products, architectural models, and other goodies seemingly at random. While the objects have been elevated to the level of fine art because of their inclusion in this show, the method of display (very democratic and not highlighting one work over another) also acknowledges the works’ real functions as houses, clothing, and advertisements. These are everyday objects whose artistic design is often unnoticed. This show is an opportunity to notice. Green advertisement, PR points for Toyota. While there is so much on display, two projects dominate the show right away because of their size and positioning. First is the Saatchi and Saatchi-design Toyota Prius Harmony Florascapes, represented here by a cheeky, playful model. 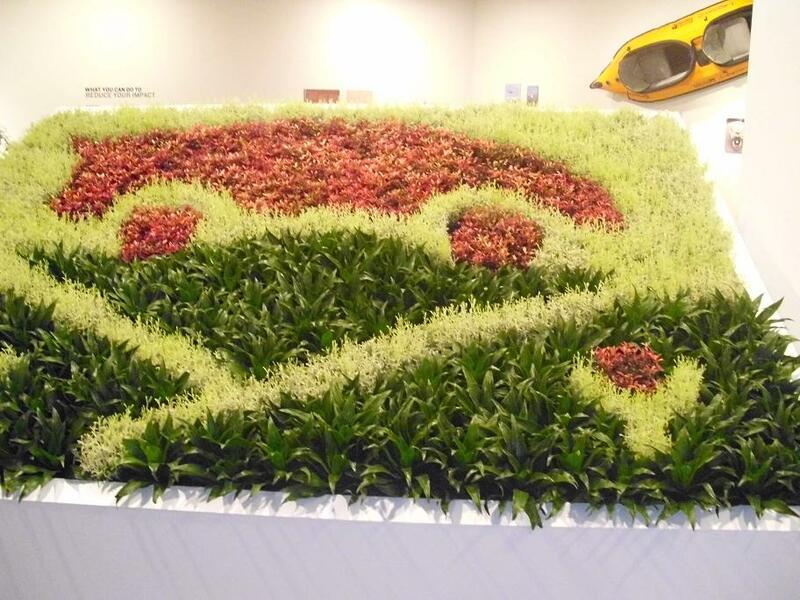 The project was meant to be a green way of advertising the third generation prius—a replacement for a billboard. This work is exemplary of the theme of Action/Reaction, which explores how designers are dealing with or inspired by challenges and uncertainties involving the economy, politics and the environment. Another work inspired by environmental concerns is the project Where Does It Go? by Indhira Rojas and Ellen Keith. 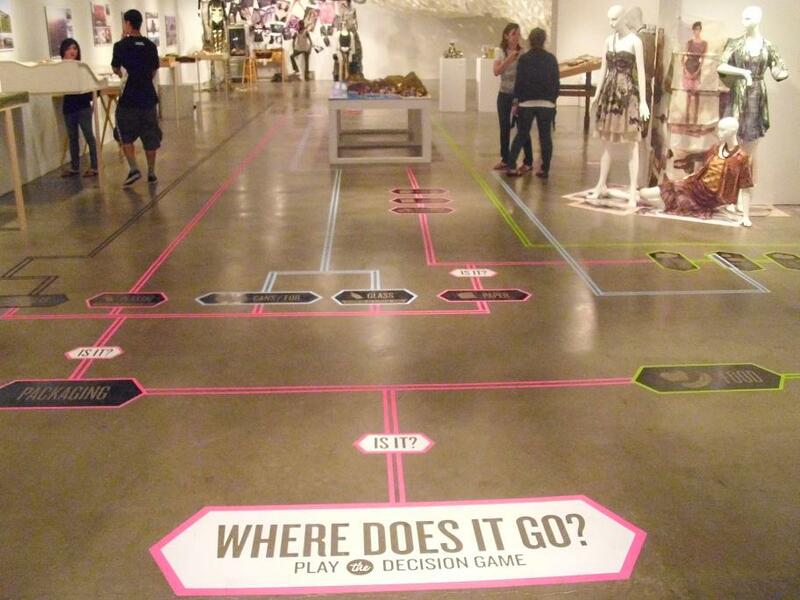 The conceptual map in vinyl is placed across the length and breadth of the gallery. It is always underfoot and therefore unavoidable through the show, but at the same time it does not distract from the other work. A person can choose to follow the whole map or not, the same way a person can choose to recycle or not. It’s a well-designed educational tool. Is the person wearing this outfit taking public transportation? Other favorites included First Earth Battalion by fashion designers Michel Berandi and Simonida Tomovic, and the Metro Neighborhoods Posters. 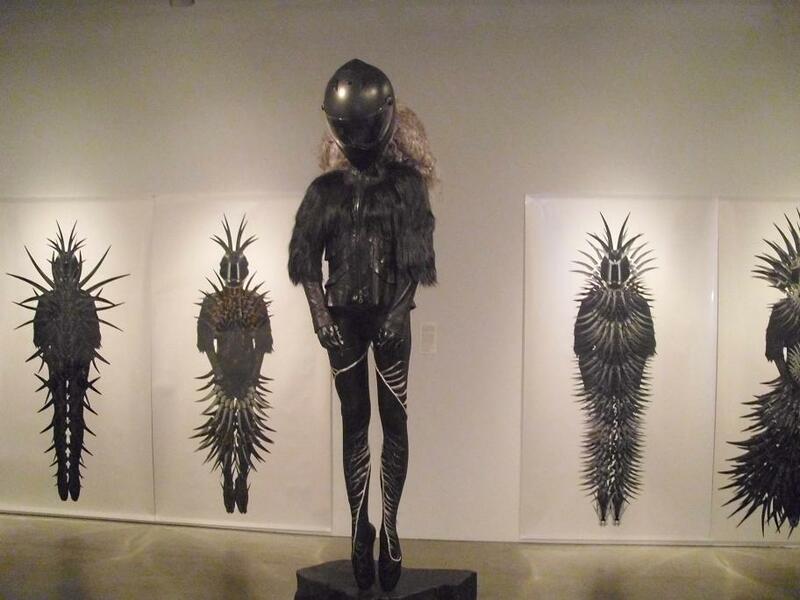 The Lady Gaga costume (accompanied by large dramatic sketches) was displayed alongside the Metro posters, even though the two things have little or nothing to do with each other. But they are in dialogue: the fashion design is highly theatrical (not everyone is going to be wearing this, I mean hopefully) and demand attention, whereas the posters are unobtrusive, but are nonetheless well-designed. Reuse in a museum display. Other methods of display were used for the architecture category. 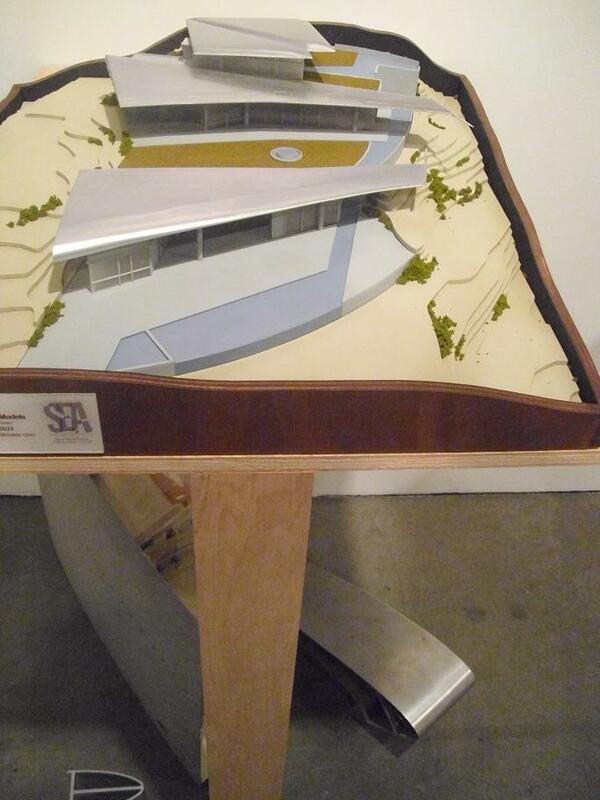 Many well publicized and well-known projects were included in the show: the Baldwin Park Scenic Outlook, Inner-City Arts, the Annenberg Community Beach House, and the well-publicized 747 Wing House. The displays included large concept posters with plenty of photos, and models of the projects. The 747 House display even had a portion of reclaimed aircraft displayed alongside it. Another multiple-faceted display was the Esquivel Shoes. 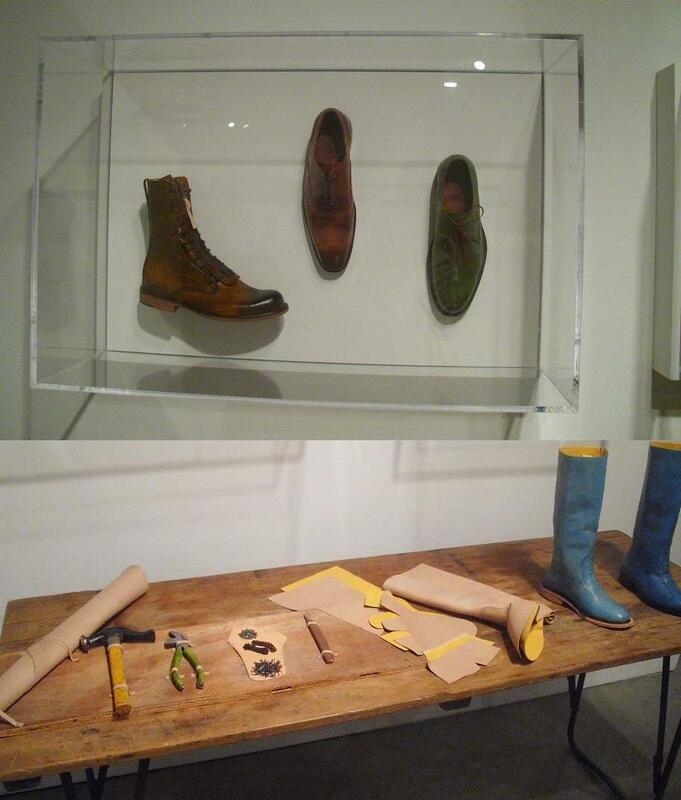 Some shoes were presented in vitrines and display cases, while in front of this a work table had been place on which shoes in various states of construction had been placed. This display revealed the craftsmanship and artistry that curator Rose Apodaca identifies as qualities that constitute the “Reaction” to the “Action” of mass produced, cheap clothing. 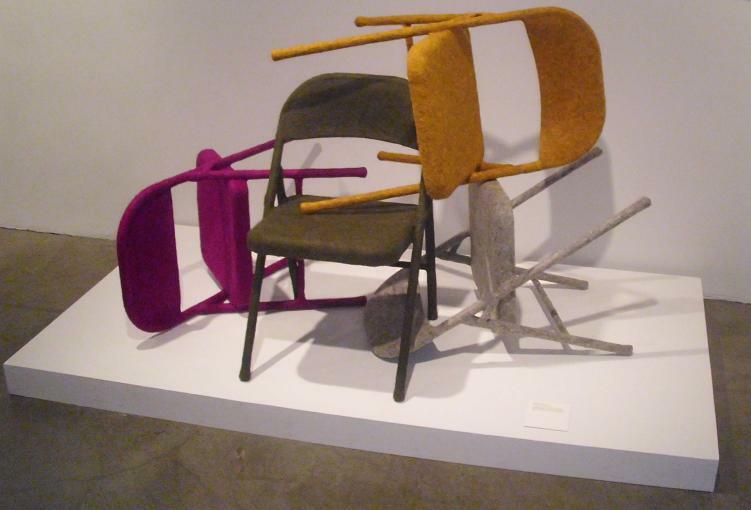 High Inquisitor pick: Felt Chairs by Tanya Aguiñiga. Tagged with 747 Wing House, Action/Reaction, Alissa Walker, Annenberg Community Beach House, architecture, Art Center College for Design, Baldwin Park Scenic Outlook, CalArts, California Design Biennial, CDB, design, Dwell magazine, Ellen Keith, Esquivel Shoes, fashion design, Felt Chairs, First Earth Battalion, Frances Anderton, gelatobaby, graphic design, Indhira Rojas, Inner-City Arts, kayak, Louise Sandhaus, Metro, Metro Neighborhood Poster, Michel Berandi, Pasadena Museum of California Art, PMCA, Prius, Prius Harmony Florascapes, product design, Raven Kauffman, Rose Apodaca, Saatchi and Saatchi, Simonida Tomovic, Stewart Reed, Tanya Aguiniga, Toyota, transportation design, Where Does It Go?